Rice is the staple food for more than half of the world’s population. Approximately 3.3 billion people depend on rice for more than 20% for their daily caloric intake, and 1 billion people depend on rice for their livelihood. 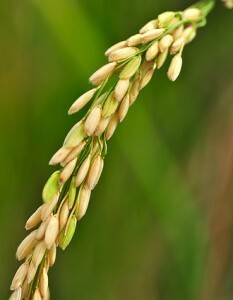 More than 90% of the rice is produced and consumed in Asia. About 560 million people in Asia, where rice is a dominant crop, live on $1.25 per day. In Sub-Saharan Africa, 10 million ($3.6 billion) tons of milled rice is imported was imported in 2008. Rice productivity has been severely affected by several diseases, insect, and abiotic stresses. In addition, climate change further threatens rice productivity mostly from water shortage, low water quality, thermal stress, rise in sea level, floods and more intense tropical cyclones. Global rice production in different ecologies have the following distribution: 55% in irrigated, 25% in rainfed lowland, 12% upland, and 8% flood prone. World rice production has more than doubled (256 million in tonnes) in 1965 to 680 million tonnes (2008). To meet the growing need of increasing human population – 25% more rice needed by 2020. A number of biotic and abiotic streeses continue to threaten rice productivity .The other important challenge is how to increase rice production with less water, less chemicals, less land and less labor particularly in the context of global climate change.